I wake for some unknown reason in the early, still-dark morning. A quick glance at the clock reveals that it’s 5am, so I settle back into bed, willing myself to sleep. I want and need those next two hours of slumber. As I try to resume where I left off, an idea for a blog post pops into my head. A pretty good idea, too — good enough to get my conscious mind into gear. Dang, now I’m wide awake. That’s my Muse for you. She shows up at the most inconvenient times: in the shower or while driving. She almost never contributes when someone asks an unexpected question during a podcast interview. She operates on her own terms. The Muse is my label for the mental processes involved with creative insight and the thoughts arising below the conscious, inner narrative. (See the posts Writing Fast and Slow and What Inspires Your Writing.) The Scribe, the counterpart to the Muse, represents the hard-working, rule-following, and linear-thinking mental processes. Thinking of the Muse and the Scribe as separate contributors and collaborators is a useful fiction, helping me to get a handle on the various parts of the writing process. For example, when I’m stuck without good ideas, I don’t bemoan my lack of creativity. Instead, I recognize that I am not including the Muse in the work and take steps to change that. When I find myself humming a song that’s indirectly related to a problem I’m trying to solve, I detect the Muse communicating indirectly. And when I wake up thinking about a book idea at 5am, it’s not because I’m losing my mind or obsessed with work. It’s because the Muse is nudging me awake like an over-active kitten – irritating but still beloved. Successful writers know how to invite the Muse to the work, dealing with its unpredictable nature. The Muse reacts better to gentle persuasion than force. Others reported showering, bathing, or taking a nap as favorite productivity strategies. Napping for productivity – this is what I love about the writing community! But it works. We’re more productive as writers if we can get the Muse to contribute. And to get the Muse involved, we have to get out of the office. The Muse doesn’t keep office hours. Leave room in the schedule for inspiration. The Muse operates by making connections between different areas of your brain, finding new threads and links. This happens best if you leave space in the schedule for pondering and “musing” on your topic. 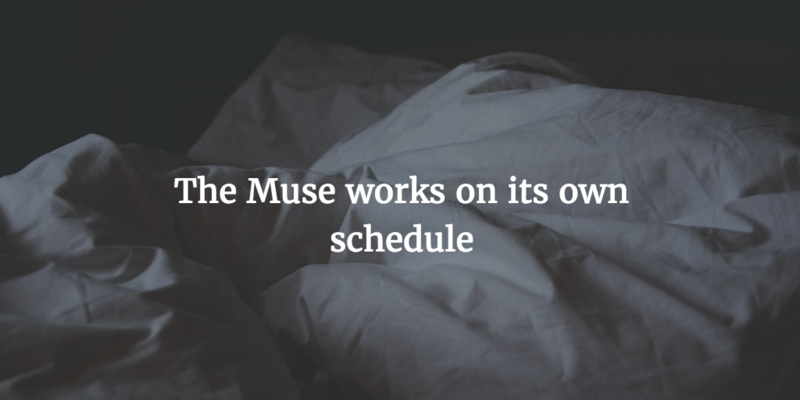 The Muse keeps its own schedule. Respect and welcome the Muse’s contributions. When the Muse does chip in ideas, be prepared. Use the voice memo function on your smart phone. Keep a paper and pencil by the bed if the Muse likes to chirp up in the middle of the night. Be ready to capture those ideas, without judgment, and the Muse will keep showing up. For more suggestions on working with the Muse, see the book The Writer’s Process: Getting Your Brain in Gear. I am downloading your book. I know I have a book in me. I have been working on it mentally for a long time. I guess I have been afraid to start because it can be so personal. That’s great to hear! I hope you find the courage to start writing it and find the book (or books!) within you.